Sample size of our popular Baby Balm. Un échantillon de notre produit plus vendu, baume de change. What do you get when you combine the natural smell of patchouli with cinnamon, cocoa and coffee? Only the best soap I have ever come across? 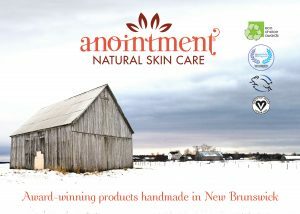 I’m in love with Anointment Natural Skin Care om shanti soap and was saddened when the bar that was bought for me as a gift ran out. April, your products are incredible and you have one very happy new customer.